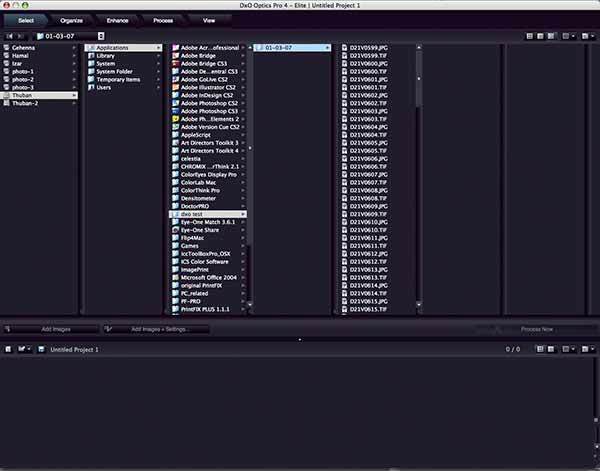 In this review Keith looks at some features of DxO Optics Pro V4.2. 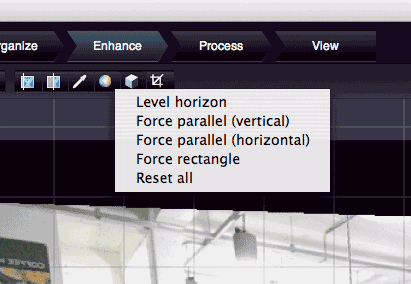 We’ve reviewed earlier versions before, but V4.2 has added a lot of workflow related features, as well as a whole host of image processing options that help get the best out of your camera’s images. 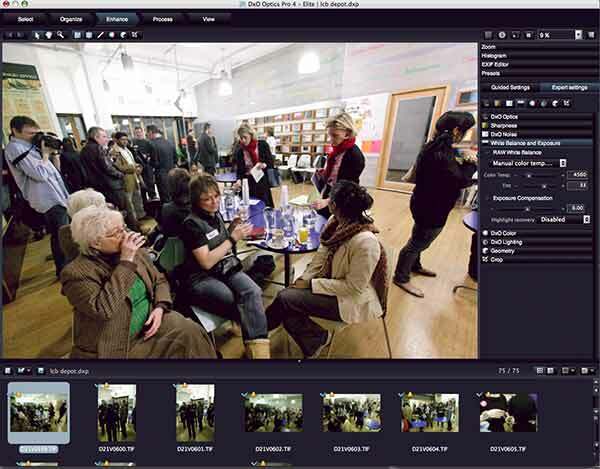 Keith has used previous versions of DxO for processing many of the raw camera files for his large exhibition prints. 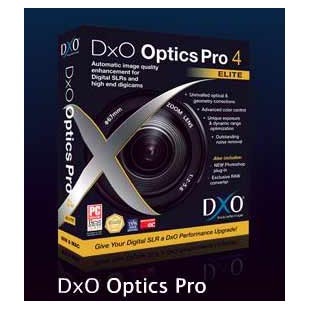 What do you get with DxO Optics Pro 4? I’ve used previous versions of the software both for their ability to correct image distortions (lens and camera related) and to pull out image detail and tonality that helped me create images the way I wanted them to look. 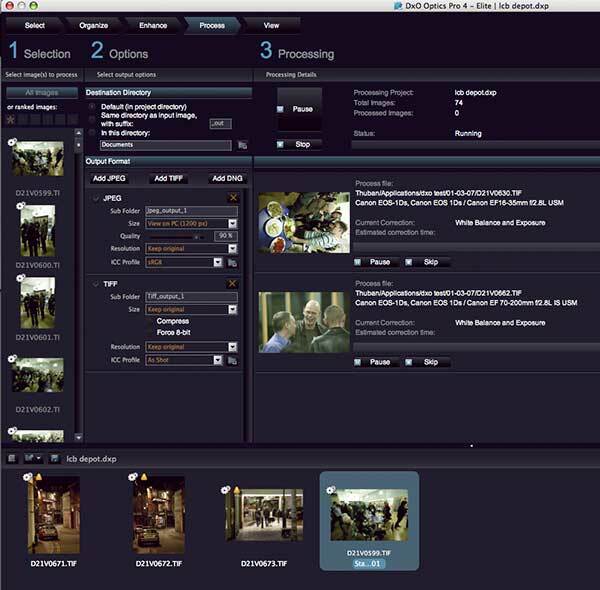 The software is available for particular camera/lens combinations only, and comes in three different versions. The range of supported equipment is growing and is listed on the supported cameras and lenses page on the DxO web site – however do check that your equipment is supported. There is also support for processing JPEG images out of a variety of consumer cameras, although without raw file support the results are not going to be up to digital SLR levels (my own pocket camera isn’t supported so I haven’t been able to test this out). In the past I’ve used the software for specific images where the additional processing and setup time was not a concern. For the several hundred images that I might get from a typical commercial shoot I was far more likely to use ACR in Photoshop (or Lightroom). 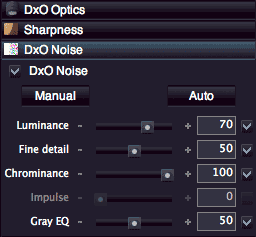 The newest version of DxO Optics Pro adds in considerably more workflow related features in a much better thought out interface layout. In fact the program has moved a bit beyond (in amount of functionality) what I’d normally cover in one of my reviews, so I’m going to concentrate on a few features that I feel make it stand out. These features are the kind of things that you may not use every day, but having them there will (in my case) mean that I can supply some images that make the (paying) client that little bit happier ;-) I’m off to California/Oregon in April/May so I’ll hopefully have a load of new images in the gallery when I’m back, where I can show some more examples. 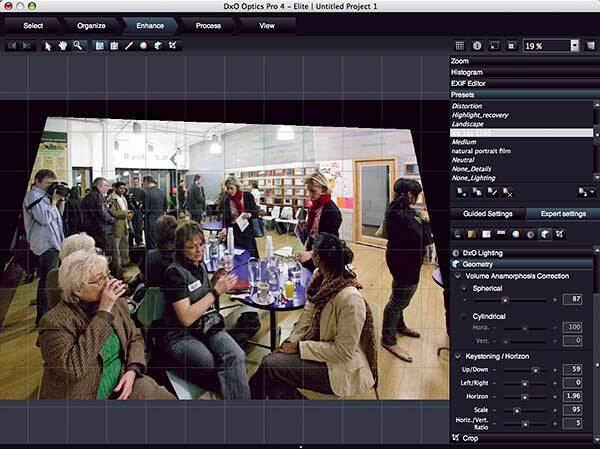 The software is available as a free time-limited demo from DxO. I’m looking at the Mac version here, but the PC version is very similar. The software can also run as a Photoshop plugin (import) although this runs the application and, rather disconcertingly* on a Mac, causes the main menu bar to vanish. The images processed, open immediately in Photoshop. DxO also offer a Film-Pack which accurately produces various ‘film looks’ from your images – I’ll be having a look at that in a separate article, although I have to say that a quick try with some of the images I’m using as examples in this article gave a very good Tri-X B/W film look. The software is available via download, or boxed version. You will need to ‘activate’ it to use it fully. There is a comprehensive 69 page PDF manual supplied, and I’d suggest that you really do give it a read through. Now I’m not a natural manual reader, but I had to look at it to get an idea of just why I should be organising my images into collections and the like, and how to use the various sorting and selection options. 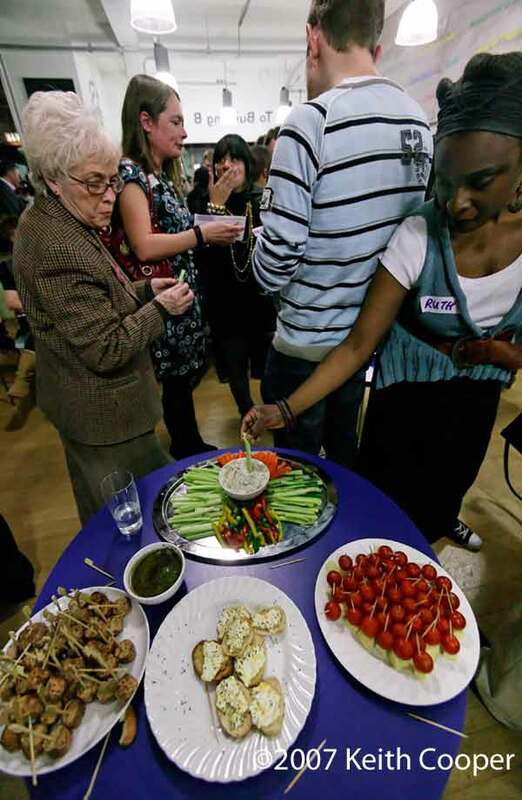 I’m going to use a collection of images I shot at a local business networking meeting as an example. The view below shows where I’ve selected a folder of files — in this case JPEG and Raw from my Canon 1Ds. The lighting at the LCB Depot in Leicester is truly awful for photography and embodies all I hate about fluorescent based lighting when you are taking pictures. The colours look awful. but at least it’s bright enough that I can shoot without flash at ISO 1250. That means there is going to be appreciable noise in the images as well. I’ve also taken quite a few shots with my 16-35mm lens, so there is going to be some interesting (and generally non-flattering) distortion both from a geometric and lens aberrations point of view. So far, pretty simple – it was the selection of images that caused me a few initial problems, however I was able to rotate images the right way up and select all the images (the raw ones) I wanted to work on quite easily. There are lots of mechanisms for getting the images you want selected – you can even apply a preset conversion type when adding images to a project. So I’ll skip over the various processes by which I selected my images, since I’m sure my way was not perhaps the best. First of all the white balance. The side by side view is available for all corrections and gives a very good feel for what you are adjusting. The side panel is where you select what you want doing to your images.In this instance I’ve used the eye dropper to select a part of the brightly lit white wall near the ceiling lamps. Experience at this location means I know good places to select. I also have an ACR camera ‘profile’ for this location that I made when I was reviewing the ColorChecker SG card — although I have to say I don’t use it very often. 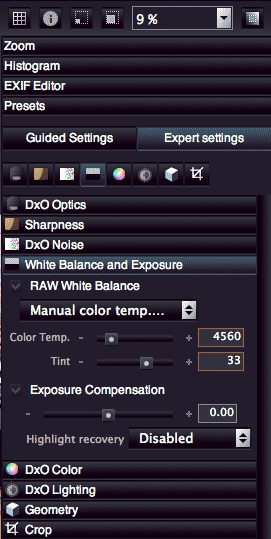 Note that in this pane you can also set exposure balance and highlight recovery. I don’t mind the nearly burnt out areas around the lights, so its ‘off’ here. There are a lot of options in this side panel – I’m not going to go through the lot here – get a copy of the demo and have a play with some files of your own.. The exposure settings are different from the DxO lighting settings, which can work at a more ‘local’ level on the image. 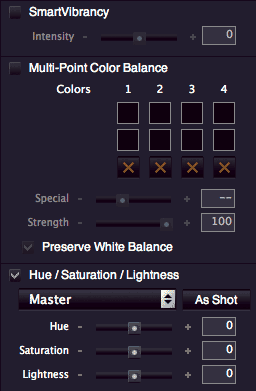 This is an area that I’d suggest first starting with the auto settings values, and only trying all the sliders in the detailed adjustments once you have a good feel for what can be done. DxO does a pretty good job of cleaning up noisy images.I find that ISO 1250 on my 1Ds (its highest setting) gives very acceptable images for web use, and with care, print as well. Basic lens aberration correction is what DxO has been doing very well for some time.All the basic settings are still here, with most of the settings being automatically set from your camera’s EXIF data. This is the part that attempts to make your lens ‘perfect’ based on DxO’s extensive testing of lens behaviour and performance. 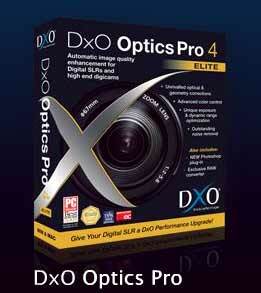 DxO actually make very sophisticated lens testing software, which is widely used in the camera industry. it’s this experience that goes into all the tricks that DxO Optics Pro performs. DxO can sharpen your images, in a fairly sophisticated way, which is based on the lens you were using and the camera body. 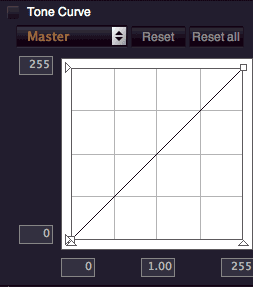 The value of the slider is deviation from ‘normal’ sharpening i.e. ‘0.00’ does mean no sharpening. If I’m making a very big print which will need resampling, I may drop this level a bit. 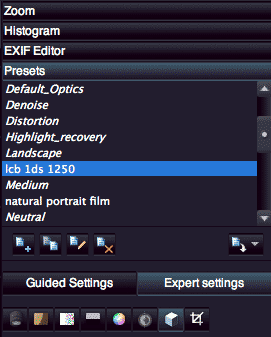 Just when you are thinking that there are a lot of things to set (there are), the presets list comes to your aid.In this example I’ve made a load of adjustments and then saved them. 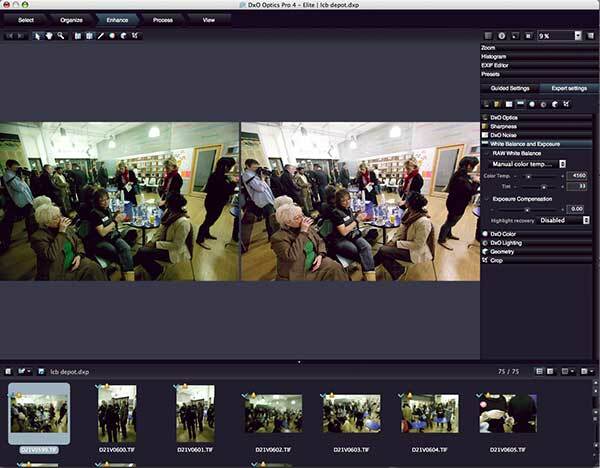 So I now have a preset for dealing with ISO 1250 images taken on my 1Ds at the LCB Depot, with its horrid lighting. This example is actually from my DxO 3 review, but shows lens issues very well. Note – I’ve got lots more examples of DxO Optics Pro at work in the older reviews, since the features that worked well there are all in the current version. 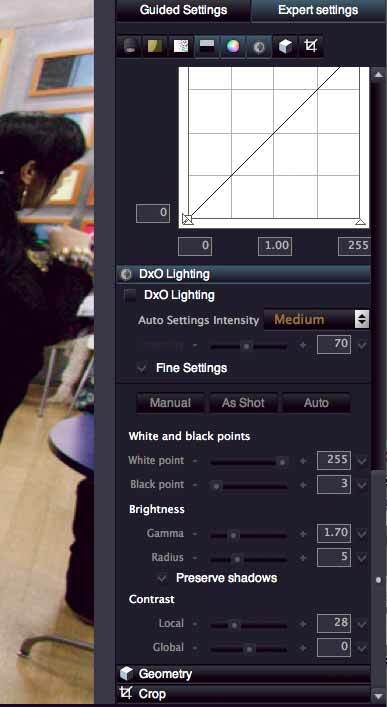 When you correct images in DxO 4.2 you can get them slightly stretched from the original aspect ratio. This fits the image more accurately to the coverage of your particular lens/camera. 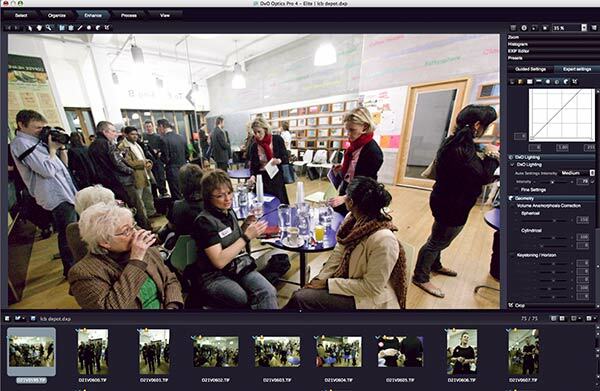 The correction is great for ‘fixing’ images taken at even shorter focal lengths, or fish-eye lenses. Unfortunately geometrically correct is not very flattering for people caught at the edge of the frame. It attempts to make the image look much more like how it looks to you at the time, however to work at it’s best it needs to know the distance of objects from the camera lens. As such this adjustment is much more subjective. It’s available in spherical and cylindrical modes. 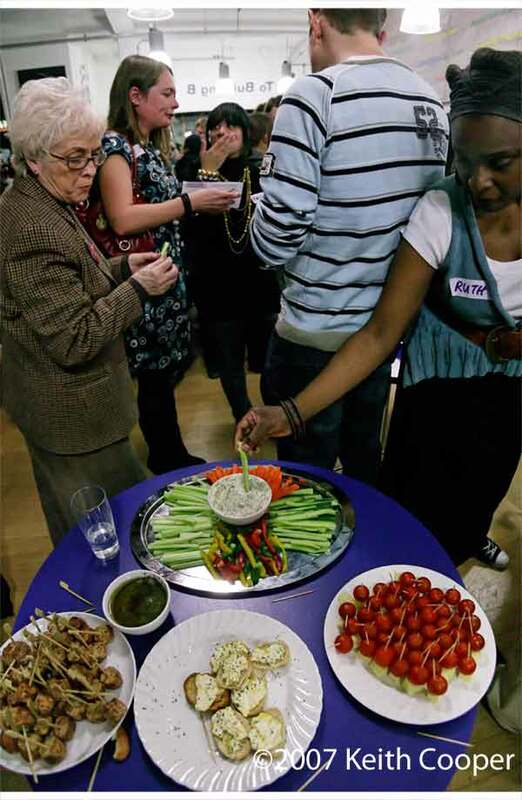 Look at the changes in shapes of peoples’ heads and the plates, and the hanging pipework near the top of the picture. You can decide just how much correction you really want for each image. 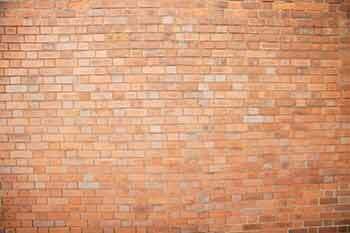 Straight lines or better pictures of the people? 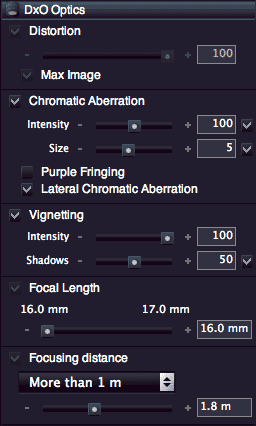 Remember that you can design a lens for either type of correction – or a balance between the two. Previously, you just got what your lens designer gave you – now you have a bit more of a choice. I’m going to be writing up some more about effective use of very wide angle lenses in the future, but look at this example of an image taken with a Canon EF15mm f/2.8 Fisheye lens. 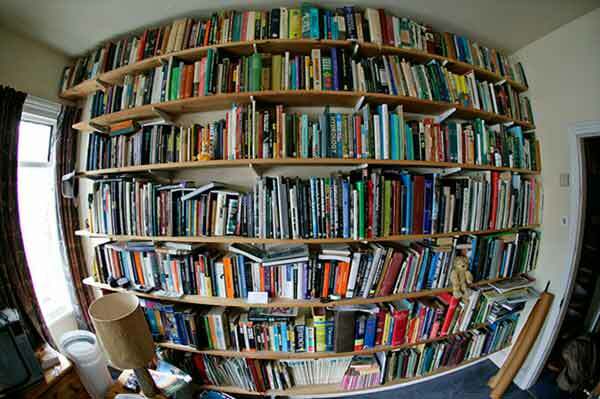 It’s the same wall of books I used in my article about using the Canon TS-E 24 tilt/shift lens. 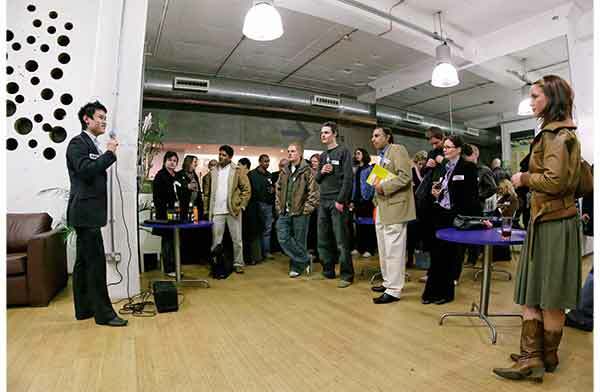 This article has pictures of this same scene taken with a Canon 16-35 2.8L as well. 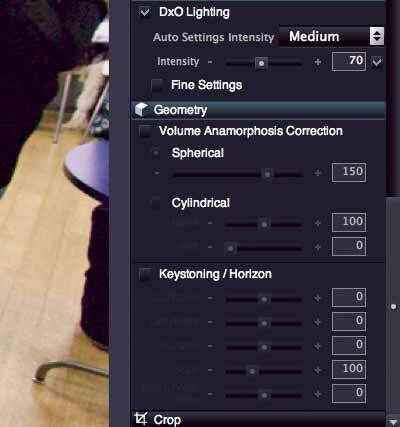 If your fisheye lens/camera combination is not supported then you could look at the review of Fish-Eye Hemi – A photoshop plugin for fixing images taken with a fish eye or very wide angle lens. I’ve left one set of adjustments to last, the DxO Colour section. Colour rendering is where you can make pictures from your Canon 1Ds look like they’re from a Nikon D40, or shot with Kodachrome 25. 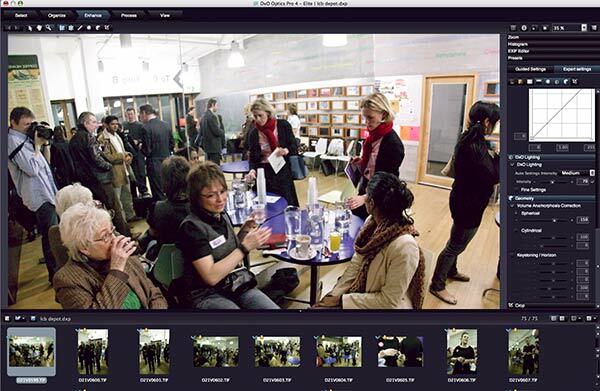 It’s also where you can include camera profiles in your raw conversion. 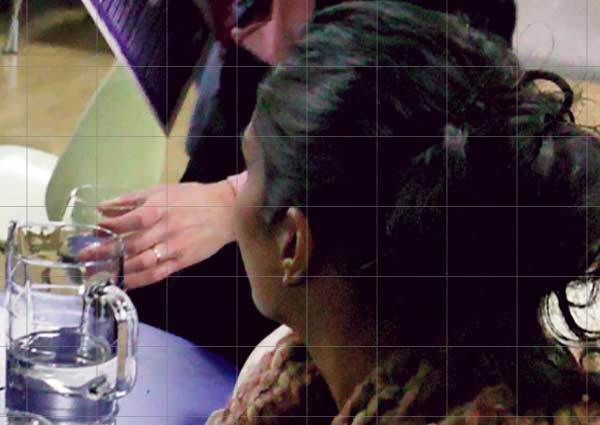 To make an ICC camera profile to use you need an image of a test target produced by DxO Optics Pro, to work on. If you have loaded an image of a profile test target, you should use the ‘Export’ image function to produce a tiff file for your profiling package to use. A lot of options, so I’d suggest taking a good wide selection of test images to play with when you are trying out DxO Optics Pro. 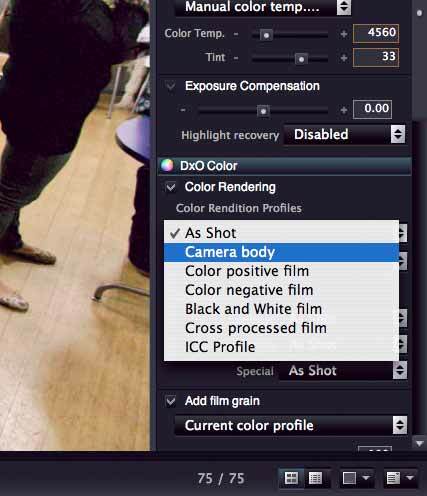 Colour rendering lets you apply a specific look to your Raw images, starting right from the very look of specific camera bodies, referred to here as ‘colour rendition profiles’. 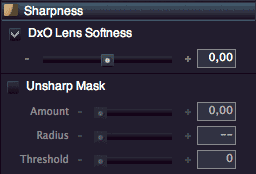 This functionality will slightly differ if you have activated the DxO FilmPack. 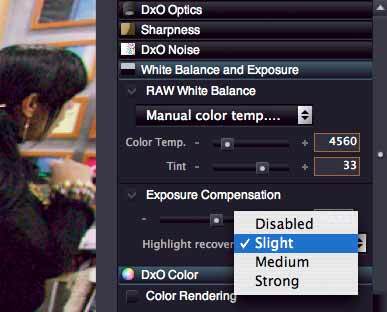 There is a check box to enable this function, and a combo box lets you choose between ‘Original’, Neutral’, and ‘Realistic’, along with specific colour rendition profiles for 7 families of cameras currently supported by DxO Optics Pro. Realistic is the “flat” colour rendition profile, without any interpretation, with a gamma valued at 2.2. Neutral has the same colour rendition, but with a contrast slightly increased. There are some very powerful and interesting techniques here, but I’ll leave some of the details for the review of the DxO Film Pack, which I hope to have on the site before too long. SmartVibrancy is a DxO term for increasing (or turning down) the ‘punch’ of colours without the potential nastiness of just cranking up the saturation. The Multi-point allows some quite complex matching of colours. 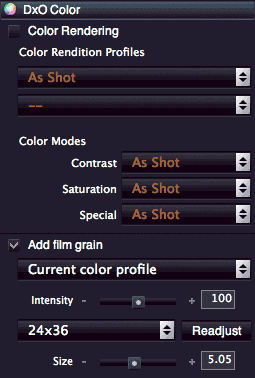 You can apply custom tone curves to your images. One way of applying global curves corrections to a series of images. This can be done on a per-channel basis. After making all those settings it just comes to actually processing those raw files. 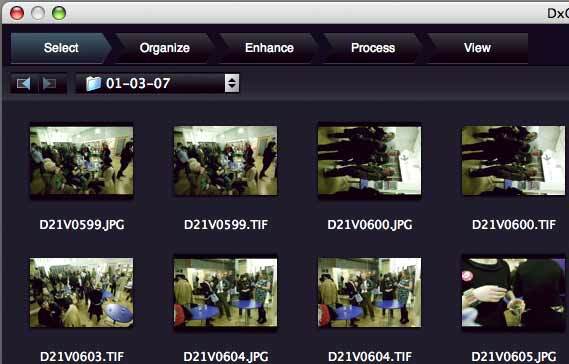 One of my major gripes with earlier versions of DxO Optics Pro was their speed on my various Apple Mac computers. For my own use I can now see more occasions where I might use DxO for my commercial work. I already use it for some of my B/W landscape work since DxO processed colour images sometimes convert much more nicely to black and white – there is also the fact that DxO handles images of sunsets from my 1Ds a lot better than ACR (the only raw converter I generally use for ‘everyday’ work). V4.2 is a noticeable improvement over the last version (3.5) that I looked at. The image processing was always great, but V4.2 will get fired up for more than just special images. 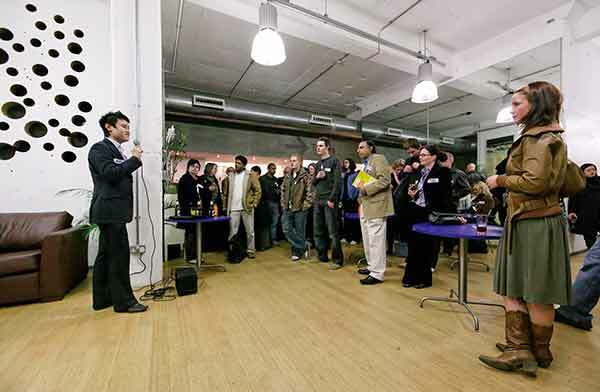 Perhaps not yet my day to day image processor of choice, but now of serious use for some of my normal commercial work. 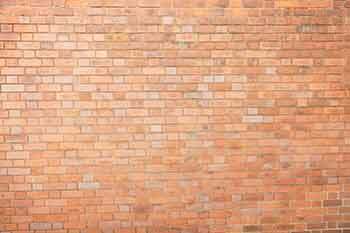 As a former usability researcher, the interface still has a -slight- ‘built by engineers’ feel about it to me, but with a bit of practice –and reading the manual– it should be very easy to pick up and learn. The shear amount of calculations it’s doing mean that it will tax average computers, but I can see a lot of work has gone into providing much better (and quicker) previews of what the various adjustments will do. If you get the demo – try it first at some of the auto settings. 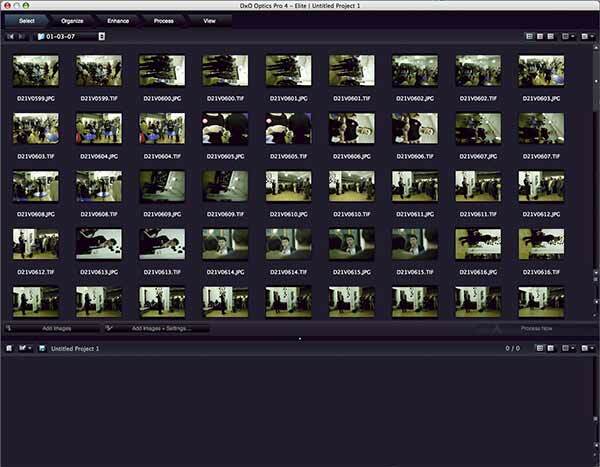 Select a dozen or so good raw files that you know well, pop them in a test folder and just point DxO Optics pro at it. Then have a good look at them and compare them with your previous raw conversions? Provides a wide range of corrections to image problems — some of which you might not realise you had, until you see DxO processed images. A lot faster than earlier versions, and the interface is much more intuitive. The quality of the corrections is excellent and really helps get the most out of your camera’s raw files. Complex, but well worth getting the free demo to see how you like what it does.